Francis Enwright, 88, poses with her autograph book, signed by Eva, and a photo of Eva with her family. Oswego's Safe Haven Museum is marking 70 years since Fort Ontario served as a camp for Jewish refugees fleeing Europe during World War II. To celebrate the event, one Oswego resident who lived near the fort at the time talked about what it was like and tells the story of her long-lost friendship with one refugee. Francis Enwright was 18 years old when the 982 Jewish refugees were brought from Italy to Oswego to stay at the decommissioned Fort Ontario barracks on the city's east side. They were called 'guests' of President Franklin D. Roosevelt, but they spent their first weeks quarantined behind a chain link fence. Enwright, like many others in the community, was interested in meeting their new neighbors. Armed with an autograph book, she started gathering signatures. "The biggest gift you could give someone for their birthday wasn't like today's gifts of electronics and stuff," Enwright said. "It was a simple 50 cent book. And so I had a new autograph book given to me by my girlfriend, so I always took it with me. So, I had the book with me and I went across the street and started talking to the refugees." 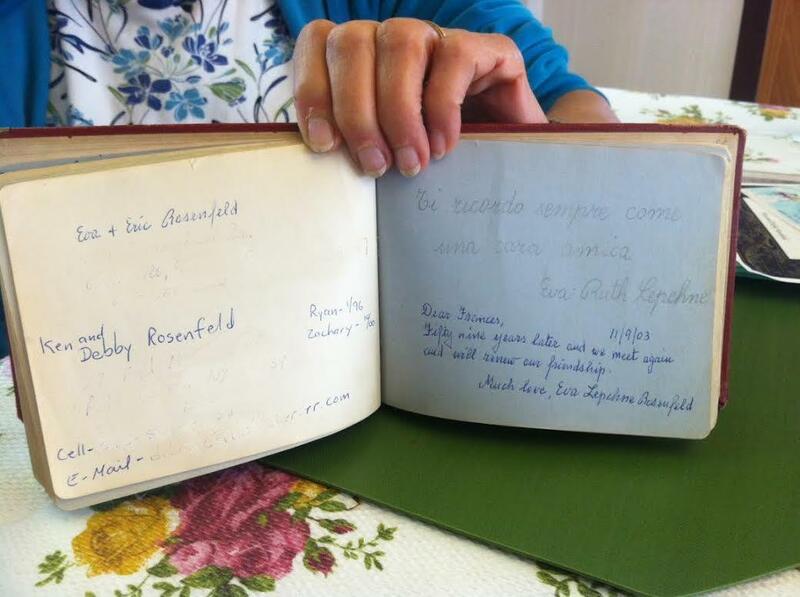 Eva's original signature (in Italian) sits above her more recent signature, 59 years later. This photo has been edited for privacy. Enwright says she quickly bonded with the refugees because she could speak Italian, including one young woman named Eva. "We had a connection," Enwright explained. "They liked the Italian people because they were nice to them when they were over there. So I started conversing with them. And then, of course, I had my autograph book and I asked them to sign it. So I have all the signatures of my friends." That little autograph book continued to play a big role in Enwright's life nearly six decades later. Over time, she lost contact with every refugee that signed their name, including Eva. But Enwright never let go of that autograph book. Enwright was called in to work at the Safe Haven Museum as a volunteer by the museum's vice-president to cover for her. Not one to disappoint, Enwright when to the museum to work. When the vice-president returned, Enwright says something amazing happened. "I was looking at my book and the vice-president said, 'Can I see it?'" Enwright said. "And so I showed her and she went, 'Oh, my God! Oh, my God!' I had no idea what she was reading, because in my book all my friends wrote little jokes and funny things. You know what it was? The girl that signed my autograph book 59 years ago, she was the guest that was coming that day." Francis Enwright poses with a photo of Eva, who was one of 982 Jewish refugees living at Fort Ontario. Enwright and Eva kept in touch ever since, becoming close friends. Enwright was even invited to Eva's grandson's Bar Mitzvah a couple years ago. In her letters back and forth to Eva, Enwright says she also learned about what had happened to Eva's family during the war, like many others that were left behind. "This young girl, she came home from school," Enwright said. "Her cousin ran to meet her when she was walking home from school and she said, 'They took your father.' So when she went home, her grandmother said, 'Would you bring this bag of things to your father?' It was like shaving things, maybe a change of clothes. And when she got there, they said, 'He won't be needing that where he's going." Enwright says Eva's father was sent to a concentration camp where she says she believes he later died. But Enwright says learning from the refugees what had happened so many miles away to innocent people has made her more aware of similar problems the world faces today. This weekend's reunion might be the last time the museum honors refugees while they're alive. Museum officials say within the next decade, it will start holding memorials instead of reunions. But while Oswego honors 70 years since those Jewish refugees stepped foot into the Port City, Enwright says the story of Fort Ontario and those 982 people needs to be remembered because it could happen again today. "I think the American people realize that when a country needs help, listen. Don't just put a deaf ear and say 'it's not our problem,' because it is our problem." Beginning Thursday, the Safe Haven Museum in Oswego is celebrating the 70th anniversary of when 982 Jewish refugees were first housed at Fort Ontario. In 1944, President Franklin Roosevelt allowed 1,000 Jewish refugees to enter the United States as guests, and they lived at the decommissioned Fort Ontario base in Oswego until 1946, when they were allowed to stay as American citizens or return home. The refugee camp, known as "Safe Haven," was the only location of its kind in the U.S.